Elvis, aka Mighty Mr. 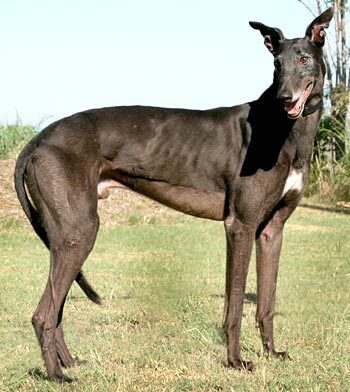 Cool, is a handsome, 3½-year-old, black male born October 2, 2006. His sire is Impossible Dream, and his dam is Greys Gemstone. 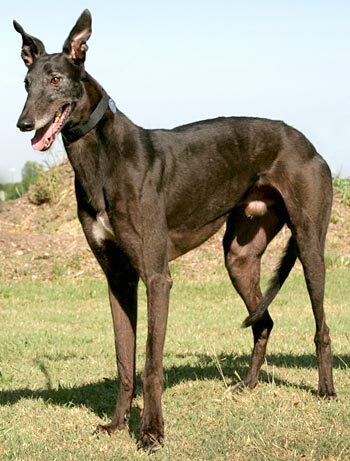 Elvis has 25 races to his credit starting July 16, 2008, at Wheeling Downs, WV, moving to tracks in Maine and Texas several times before his retirement on November 18, 2009, at Gulf Greyhound Park in LaMarque, TX. He is a happy and laid-back boy who will make a wonderful companion to a lucky home. Elvis is such a sweetheart. He LOVES to snuggle and is learning how to wrap his head and neck around you to give hugs. He isn’t much of a kisser but he will rub his wet nose on you to show his affection. He comes around to my side of the bed every night to give me a goodnight kiss and get in a few more ear rubs before he goes into his crate. He sleeps well thru the night (unless one of our greys wakes him up). He is a good eater and hasn’t shown any food issues. He is curious what is in the other food bowls, but will back off with a firm “No, Elvis!” He has finally discovered that treats are a good thing, but will still not take them out of my hand. He will eat them if placed on the floor right in front of him. He ignores our two cats for the most part. They both got a quick sniff in the first few days he was with us and that seemed to satisfy his curiosity. Elvis does very well with our two boys, ages 5 and 2. He enjoys watching them play and is very affectionate with them. He settled into home life very well. 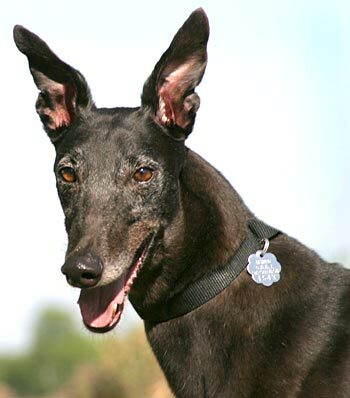 He enjoys a quick 5 or 10 minute round of “run the track” in our backyard each day with our two greys and then it’s off to have his regular 23 hours of naptime. Elvis is not crated when we are not home. He stays in our home office with one of our greyhounds. He does well in there even if we are gone a full day. He sleeps in his crate at night with no problems. He goes in completely on his own and actually prefers to have the door shut. We tried leaving it open several nights but he whined until we shut it. He will also go nap in his crate during the day when he wants a little “alone time.” I think he would do fine in a crate if we were not at home. He has not shown any separation anxiety issues at all. Elvis makes a little noise when we get our two greys “rooing” but he seems more confused by the noise than anything else. He will bark when he’s in the backyard if he hears a strange noise, but it doesn’t last long. He loves to lie in the sun no matter how hot it may be. He is never lying in the shady spots, always right out in the middle, right under the sun. I’m not sure he really knows what to do with stuffies. He mostly just carries them around in his mouth. Elvis's personality will continue to unfold with time, but he's certainly enjoying retirement so far!